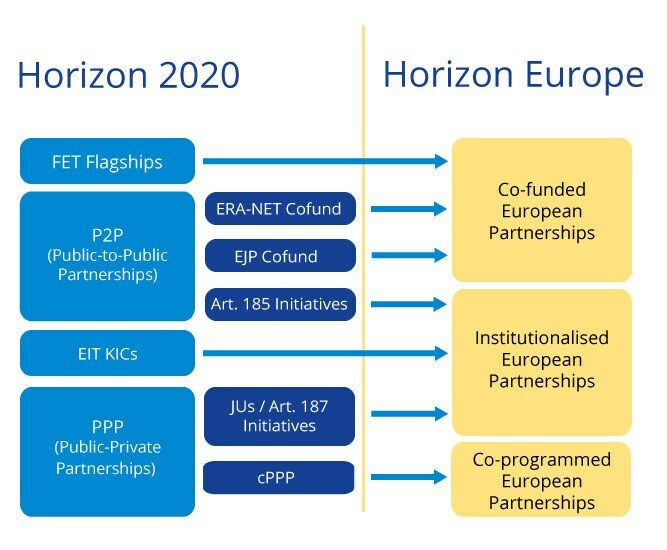 On 7 June 2018 the Commission adopted its proposal for Horizon Europe, the 9th EU Framework Programme for Research and Innovation, which will become operational from January 2021 onwards. While the proposal's overall policy is ‘evolution and no revolution’, the part on ‘European Partnerships’ differs significantly from Horizon 2020. For the first time, an overall policy approach for all kinds of partnerships, from ERA-NETs to JTIs, FET Flagships and even the EIT/KICs has been developed and uniformly labelled ‘European Partnerships’. Institutionalised partnerships (based on Art. 185 or 187 TFEU, and EIT regulation for KICs). The European Commission wants to streamline the number of partnerships in order to increase their effectiveness and impact. In addition to aiming for more synergies with the Structural and Cohesion Funds, Horizon Europe will also promote effective and operational links with other future EU programmes such as the European Defence Fund, the Digital Europe Programme, and the Connecting Europe Facility, as well as with the international fusion energy project ITER. A compilation of all provisions of the Commission Proposal for Horizon Europe is available here. An emerging issue in the forthcoming discussions on European partnerships is related to options for improving the efficiency of implementation, which is one topic that a specific ERAC Working Group on R&I partnerships is working on. Based on a request of that working group, ERA-LEARN developed and analysed a corresponding survey on efficiency of implementation, which was addressed to all three categories of partners, from policy makers to research funders implementing P2Ps and to researchers funded by P2Ps. The ERAC ad-hoc Working Group on Partnerships has been established in early 2018 to contribute to the discussion on rationalising the R&I funding landscape, to better exploit the potential of partnerships for R&I policy in Europe and to create a transparent and accessible partnership landscape for all parties involved. The group is working on a criteria framework for partnership initiatives and the design of a strategic coordinating process. It furthermore looks into rationalisation aspects and questions related to increasing the efficiency of implementation. In the context of the latter it addresses also the identification of measures to increase the efficiency of partnerships' implementation. The ERAC Working Group has already released reports on criteria for selecting EU research & innovation partnerships and on a long-term strategic coordinating process for the selection, implementation, monitoring and phasing out partnerships. The ERAC Ad-hoc Working Group on Partnerships has developed the concept of a survey, addressed to ERAC members, research funders implementing P2Ps and researchers funded by P2Ps. This has been further developed and implemented with the support of the Commission Services and ERA-LEARN (University of Manchester and OPTIMAT). The final extraction of results took place in mid-March 2018. The following figures show the full results and conclusions for the questionnaires responses submitted by ERA members, research funders and researchers funded by P2Ps. Responses not fully completed have been included in the analysis. Final report by the ERAC Ad-hoc Working Group on Partnerships on the "Recommendations on increasing the efficiency of implementation of partnerships"
Final report by the ERAC Ad-hoc Working Group on Partnerships on the "Recommendations on rationalising the EU R&I partnership landscape and optimising its coherence"